The name says it all – Kids are great! At Kids ‘R’ Great Pediatrics, we take pride in providing excellent care from infancy through adolescence. While maintaining a small practice, we are able to obtain an intimate relationship with our patients and their families, thus getting to know them on a personal level. We have a very “kid-friendly” office with a compassionate staff that goes above and beyond to ensure that the families’ needs are met and each visit is as comfortable as possible. We provide separate waiting rooms for sick and well children, and each room has activities for them as they wait for their appointment. 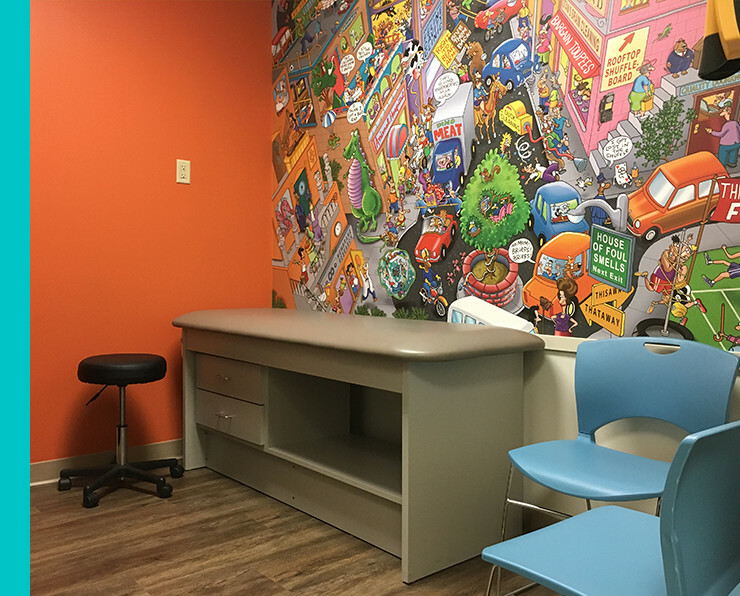 We also provide separate sick and well exam rooms, and each room has a fun and interactive wall mural for the family to enjoy. We also have a separate breastfeeding room for those who need to feed their infant in private. As a primary pediatric practice, we focus on the overall well-being of children. In addition to acute illnesses, we treat and counsel children and their families on child development and safety, mental health, behavior, nutrition, and anticipatory guidance for all ages. As a result, we build a stable, trusting, long-term relationship with you and your children. Dr. Corba was raised in a very small and humble community in central Ohio. After finishing high school, he graduated from Ohio University with a bachelors degree in biology and a masters degree in developmental neuroscience. He then received a medical degree from Wright State University and finished a pediatric residency program in pediatrics from the University of Louisville. He received his board certification in pediatrics in 2003. After working in Evansville for 2 years in a pediatric clinic, he moved to New Albany to join a solo practice. Over the next 3 years, he built a great relationship with his patients and subsequently took over the practice as the owner. 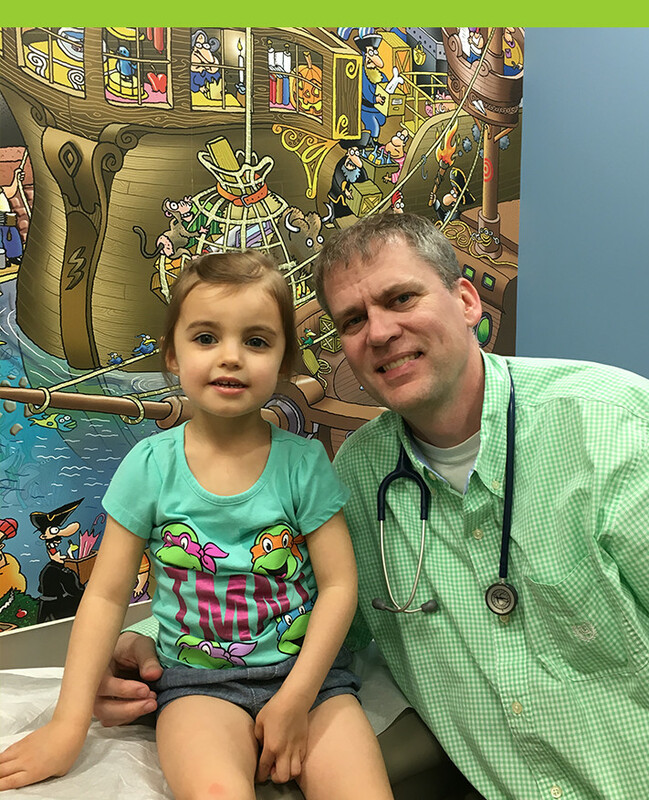 He has been growing and nurturing the practice since 2005, and has one of the few independently owned pediatric practices in the area. Dr. Corba is board certified in general pediatrics and is a fellow in the American Academy of Pediatrics. He belongs to the Indiana State Medical Association, Kentucky Medical Association, and Greater Louisville Medical Association. Dr. Corba and his wife, Adina, met while he was a resident and she was a nurse working in the NICU at University of Louisville. They have three children, Mitchell, Averi, and Hayden, who keep them constantly on the move. In his spare time, he enjoys spending time with his family doing a wide variety of activities including helping the kids with an ever-increasing number of activities, taking mini excursions throughout the year, and teaching his son about his lifelong interest in the Marvel and DC superhero universe. 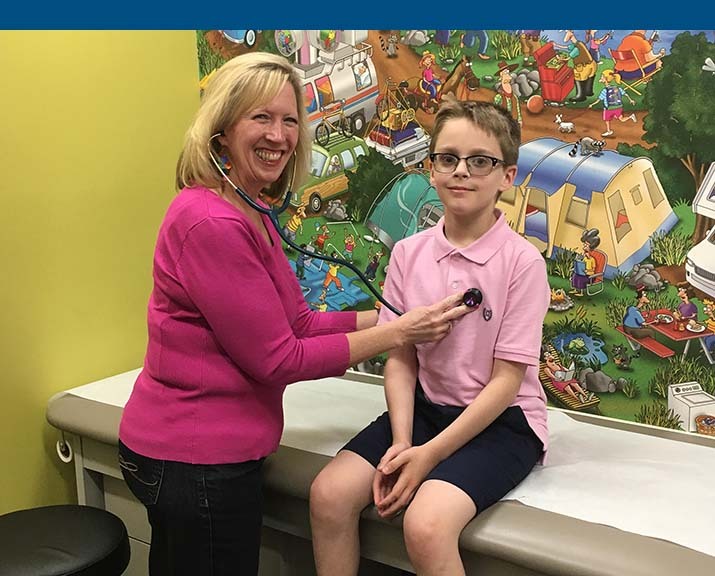 Tammy Pasko is a Certified Pediatric Nurse Practitioner. She grew up in Northern Indiana and moved to Indianapolis upon completion of her nursing degree to work at Riley Hospital for Children. While there, she obtained her Master’s of Science in Nursing at IUPUI. Tammy and her husband, Steve, and two children, Lindsey and Justin, moved to Georgetown, IN in 2001. She enjoys participating in local activities with her husband and two children. Tammy is also active in her church, serving on the church Board and teaching Toddler and Preschool classes. Tammy is a member of the National Association of Pediatric Nurse Practitioners. Her professional interests include respiratory disorders, such as asthma, allergic rhinitis, and food allergies.